One of the most interesting things about life is that we change. Our interests change. Our habits change. Our jobs and locations change. So it goes without saying that our email subscribers will change. The question is whether you can change with them. Now, I am not advocating that you launch a “singles” newsletter every time a subscriber gets a divorce. However, it can be helpful to make your email program flexible enough to accommodate subscribers’ changing needs. If I lose my day job and end up working nights at a 7-11 convenience store, I’ll be able to change my settings and receive emails in the mid-afternoon when I wake up. Also, this preference center lists different types of emails AAA sends and gives me the option to opt-in or -out. So if I go on a cruise, I can opt-out of that newsletter for a little while. Or if I am interested in taking the kids to Disney, I can opt-in to receive AAA’s emails about the destination. 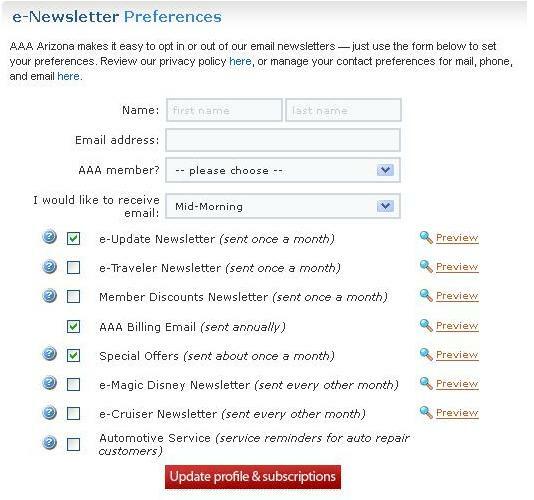 These options help subscribers tailor AAA’s email program to meet their needs, even as those needs change over time. If I want to receive more emails or fewer emails, or just want to receive them at a different time, I can easily make the changes. This can really help AAA maintain a good relationship with me as a subscriber and help prevent me from opting-out or becoming inactive. Frequency options – such as the option to receive a monthly round-up instead of a weekly newsletter. This can help you hold onto subscribers who feel their inboxes are overloaded. Alternative channels – such as the ability to connect with your company via RSS or a social media outlet. This can be helpful for subscribers who come to your preference center to opt-out but who would like to maintain contact with you on another platform. 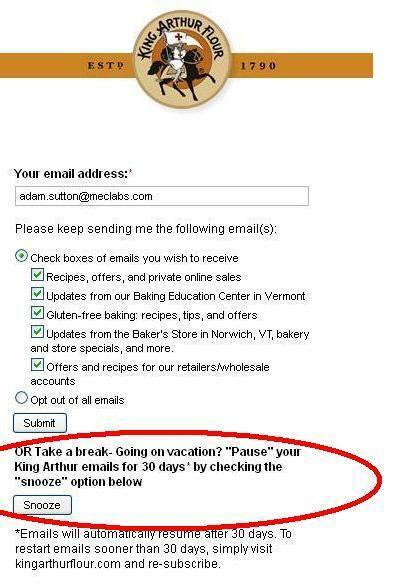 Pause or Snooze Button – such as the one from King Arthur Flour posted here. This can be helpful for subscribers who are going on vacation and who don’t want to come back to huge piles of emails. Side Note: Another great feature of AAA’s preference center is the “preview” link, which allows visitors to see a sample of the email before opting-in. This, coupled with the stated frequency of each newsletter, sets subscribers expectations very clearly for what they will receive, which helps build a healthy list. Consumer Marketing: Implementing marketing automation at a B2C company B2B Marketing Infographic: How are B2B marketers optimizing their funnel?